Yesterday my family got together to celebrate our parents' 50th anniversary - hooray! We decided to have a special dinner at their home, rather than go out. There were 11 of us. In the past, when we've roasted ducks, we've averaged 1 duck per 2 people. I figured that was a reasonable estimate, so I bought 6 ducks. Well, that was 3 ducks too many! We also had tasty stuffed mushrooms which my sister-in-law brought, and rice, and asparagus with hollandaise sauce. My husband spent the whole afternoon roasting 6 ducks in my mother's 3 ovens. I rendered 9 pints of duck fat, which are now in the freezer. (I'd thought ahead and brought a flat of pint jars with me. The guy at the butcher shop suggested I make french fries with the duck fat. I think that, or fried chicken, just might happen soon.) Dinner went off without a hitch. For dessert, we had an apple pie with ice cream. 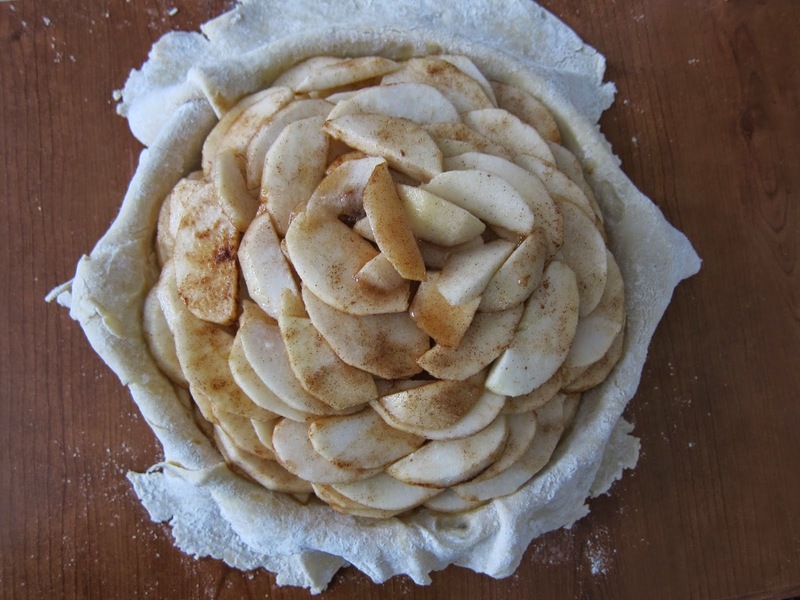 When I made the pie on Friday, I hand placed each of the slices of apple. It took a while, but it made the finished product more even and easier to work with. And it was pretty. See? Happy Anniversary, Mom and Dad, with love from us all! You out-did yourselves, all of you, and we DID have a wonderful time! The ducks were heavenly beautifully roasted and plentiful!! And the pie was exquisite! Thank you all for a very special occasion.